The Top 5 Anti-aging Beauty Trends in 2017! Aging can start as early as your late 20s. Notice how beauty companies are marketing anti-aging products for women in their 20s and mid-30s. Gone were the days when anti-aging products were only for women 40 and beyond. The late 20s and mid-30s are described by dermatologists as the pre-aging stage, when the lines around the eyes and mouth may start to show. Whether you just approached the pre-aging stage or are already in your golden years, worry no more because this year is a year for exciting innovations. The top anti-aging products of 2017 contain smart ingredients. Some of them are unexpectedly on the list. Who would have thought that probiotics would be the next big thing in skincare? To further give you more ideas about looking fresh and young, here are products and procedures to keep on your radar this year. Recent studies suggest that good bacteria, such as lactobacillus and bifidobacterium are beneficial for the skin. These probiotic bacteria have tons of benefits and one of them is supercharging our gut health. It’s all about taking care of the body from the inside out to reveal a young-looking skin on the outside. We ingest probiotics through food and supplements. Some good sources of probiotics are kefir, dark chocolate, and miso soup. On the other hand, topical probiotics are known to be an effective treatment against many skin conditions like eczema and acne. Hyaluronic acid is a carbohydrate that naturally occurs in the human body. However, our body decreases its ability to produce hyaluronic acid as we age. This is why synthetic versions gained much popularity in the previous years. They will continue to emerge this year because of their ability to boost skin elasticity. This gel-like molecule that is often used on moisturizers hydrates the skin by drawing in moisture from the surrounding environment. It usually works on all skin types but dermatologists highly recommend them for patients with dry and acne-prone skin. Scrubs and cleansers with harsh ingredients will take a backseat this time around. Instead, ultra gentle cleansers that promise not to strip the skin while removing impurities will take the lead. These soft cleansers use natural exfoliants that are effective in terms of clarifying the skin’s surface. The Euphoria Cosmedic Clinic Gold Coast is one of the well-known clinics in Australia that offers this procedure. This technique is known to reduce wrinkles, tighten skin, enhance collagen, and hydrate the skin — all that you need to achieve naturally-looking young skin. In general, you will be required to undergo at least five sessions to get effective results. The best sunscreens of 2017 do not contain any of the scary ingredients such as oxybenzone and octinoxate. These ingredients are known for their bad reputation. For instance, oxybenzone can cause allergic reactions when absorbed by the skin. It’s highly suggested that you opt for physical sunscreens that only contain natural minerals like zinc oxide and titanium dioxide. As you might have noticed, the year 2017 is a year of the P’s: protection and prevention. Protection involves the use of the most underrated skincare product, the sunscreen. For some, it could also mean undergoing treatments to achieve the best results. On the other hand, prevention is all about cleansing the skin in the gentlest way possible as well as keeping it healthy from the inside. Dealing with Colic in Babies! I wouldn’t categorize my son as colicky buy there are times when no amount of trying, makes him stop crying. This inconsolable crying that is intense and lasts for some time is the condition called Colic. This is a common condition and can start from as early as 2 weeks and last until 6th month. In my son, I noticed this from 3.5 months onwards. He is 5 months old now. ● Gripe water – This is a very popular product that is given to such babies. I bought one too. It was an over-the-counter purchase and not with a prescription from the doctor. It’s by the brand Woodward’s, which is popular where I live. It’s a gentle antacid and helps to calm down any acid reflux that happens in the baby. It is colorless and has a soothing taste. Price : Rs 40 (Approx AED 2.19) for a 130 ml bottle. ● Colicaid Drops – This is made to deal with Infant Colic, Griping Pain & Flatulence. It’s a thick, white product. It contains Dill oil, Fennel oil and Simethicone, which is an active ingredient that helps relieve colic. Price : Rs 66 (Approx AED 3.61) for a 30 ml bottle. ● Colicaid EZ– Produced by the same company that produces Colicaid Drops, this one is slightly different. The ‘EZ’ in the name stands for Enzyme. This works better than the previous one. It contains Diastase, Pepsin and Simethicone. It’s made to relieve Indigestion, Flatulence & Infant Colic. It’s brown in color, thick in consistency and has a very strong taste. Price : Rs 60.50 (Approx AED 3.31) for a 15 ml bottle. ● Colicarmin – This is my favorite one because it seems to give instant relief to him. It’s an orange / red colored product. It’s a completely herbal product with Soya, Cardamom, Hing & Sanchal in it. This is a product I highly recommend. Price : Rs 40 (Approx AED 2.19) for a 30 ml bottle. ● Babylac powder – Introducing probiotics into your child’s body is a great way to combat indigestion, which inevitably leads to more gas production. The Lactic Acid Bacillus in this product creates healthy bacteria in your baby’s intestine. It’s a white colored powder, that should be diluted in water or milk. Price : Rs 73.70 (Approx AED 4.04) for a 30 gms container. ● Putting baby in a prone position helps him to expel gas and be relieved. ● Holding him in an upright position while feeding helps him to swallow less air, thus creating less gas inside him. ● While preparing formula milk, don’t make it immediately before feeding, since you will be shaking the bottle during prep, which creates air bubbles in the milk. Let it settle for couple of minutes and then only offer it to your baby. Hope this post helps you out in some way or the other. It’s not a comprehensive guide on colic yet these are things that have worked for me. All medicines mentioned above, except Gripe Water were bought after my doc prescribed it for him. Everything was purchased from India. If you would like to buy gripe water or other popular, over-the-counter colic products that doesn’t need a doctor’s prescription, check out this US based site that ships worldwide. Digestive care that’s easy to swallow! Chances are you’ll experience one or more bouts of constipation in your lifetime. Some of the likely culprits of this condition include a low-fibre diet, not drinking enough water, taking antacids, stress, or a health problem such as irritable bowel syndrome. Constipation is a frustrating and common problem that plagues up to 15% of us at any one time – most of whom are women – sigh*. Natural remedies such as taking probiotics may provide you much-needed relief. It’s time to consider the gastrointestinal (GI) tract in a new light. Though it has the unglamorous function of breaking down food products and excreting the waste, it’s also a willing participant in the epic and heroic battle of good versus evil—bacteria, that is. Our knight in shining armour (A.K.A., the gut or GI tract) is home to trillions of beneficial bacterial flora that are essential for wellness. The villainous bad bacteria can take over under certain conditions, sabotaging our bodies with constipation, urinary tract infections, fatigue and other troubles. 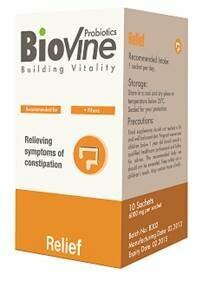 But no need to worry, Biovine Relief Probiotics can play a key role in helping to relieve constipation. BioVine Relief is a probiotic formula that normalises the intestinal function, aids a healthy digestive system and relieves the symptoms of constipation. Fibres also increase the amount of beneficial bacteria which can replenish the intestinal flora. BioVine Relief recommended you take one sachet per day. So, make BioVine Relief your Body Relief Mate!. Biovine Restore Probiotics are priced at 70 AED and available at leading pharmacies across the UAE. For more information please visit www.biovine.ae.